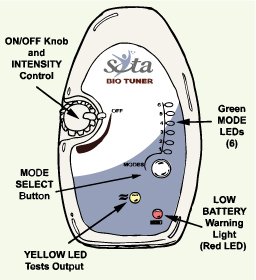 The SOTA Bio Tuner BT8 Product Manual SOTA Instruments Inc.
All the lights will flash once, before starting the unit in Mode 1. 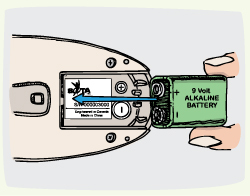 If the lights do not come on, the battery may not be placed correctly. After the 20-minute timed session, the unit will automatically cycle into Sleep Mode and the Green Mode light will flash every 2 seconds. While in Sleep Mode the battery is still being used. 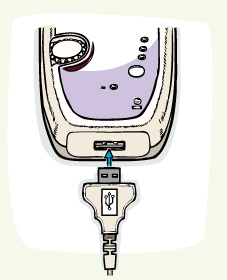 Either reset to continue or turn the unit OFF. 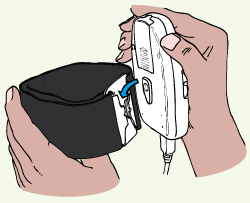 To reset, push the Mode button for another timed session. 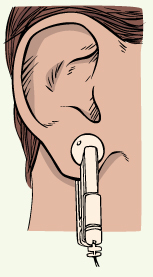 Before resetting for a second timed cycle, wet the Ear Clips again. Low Battery Warning: The Red light comes on when the battery is low. This means the battery will soon need to be replaced. The manufacturing of the SOTA Products are a global collaboration. The following countries have participated in the making of the Bio Tuner (listed in alphabetical order): Canada, China, Hong Kong, Malaysia, Morocco, Taiwan and Thailand. 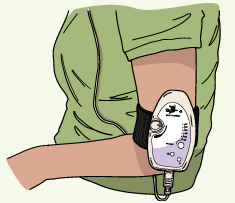 The Bio Tuner Model BT8 is covered by a three (3) year limited warranty. Please keep proof of purchase. Warranty is void if the failure is due to abuse or negligence. SOTA reserves the right to make changes to the Bio Tuner without obligation.